I thought I’d do this blog about how some of my best known images came to be created. For, no matter what the final result is, there’s always a story that never gets told. Sometimes it’s just a funny coincidence, when a car breaks down, or won’t start (usually a Ferrari…) but then there are those ‘other’ times, when a car is crashed, sets fire the day before the shoot or even, as once happened, a writer turning up hours late with a press car – because he was giving rides to his postman and son’s headmaster (yes, it happened!) Whatever goes on, the pics still have to get done, regardless, but there’s nearly always a story or two. They just never get told in the pages of the feature. 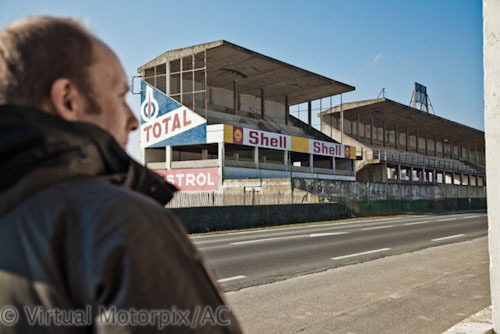 One of my best known pics is this one from Reims, with a 997 Carrera S. It was a feature for Total911 magazine, where the editor Phil Raby and I visited two old decaying race circuits; Brooklands, in the UK and Reims Gueux in France. We’d done the UK bit, leaving there around lunchtime, crossed the channel via the tunnel, and arrived fairly late in the evening near Reims. The sat nav was set for the hotel, but, I just happened to mention to Phil that the road the circuit was on was only off the next roundabout. We decided we’d pass it, just so we knew what we would face in the morning. It was about 9pm in March, very dark and the road was straight, with no street lighting. Phil was sure I’d got the wrong road, but I knew I was right. “Where is it?” he said. “It’s dead ahead. Put the main beam on” I replied. 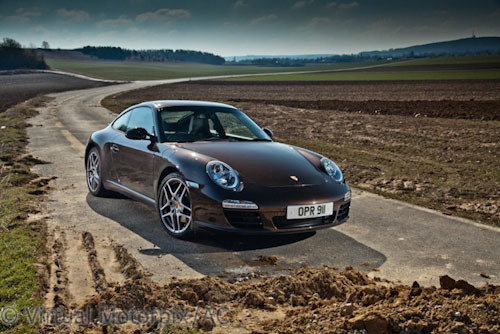 “Where?” he snapped, flicking on the 911’s superb bi-xenon main lights. As the lights went on, the very outlines of the old Reims stadium and pits appeared, ethereally out of the solid blackness. “Wow” was all we could both muster, in our awe. The sight of such a huge structure appearing literally out of nowhere was simply awesome. We rolled to a halt in the lane alongside the pits, and I jumped out to have a look. All I’d done was open the door, and look up. The sky was totally clear, and it was a new moon, so there were stars everywhere. I’d not even seen the stand, but, in those couple of seconds, I knew what I was going to do. I told Phil to grab his coat, and move the car into a better position. I set up the camera, locked the shutter open, grabbed the only light I had to hand, and took a some shots. 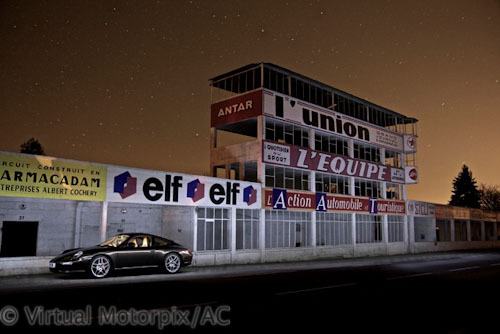 This shot is the result; a sky full of stars, an atmospheric old circuit building, and a gleaming Porsche 911. This image wouldn’t have happened if we’d not taken a detour before the hotel, and I’d not looked up, rather than out when I got out of the car. Not to mention what I used to light the car and stadium; I can’t say what I used, because frankly, I would be laughed at for ever. But, it was perfect (and it wasn’t an iPhone!). We stopped by the next morning to get some shots in daylight. At -2 degrees, under a cloudless sky the place looked totally different. 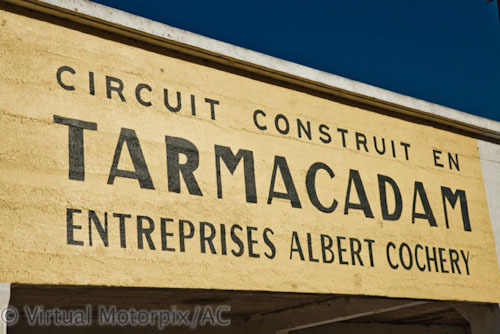 We found the end of the old circuit, heading off to a bypass, and the road literally petering out.